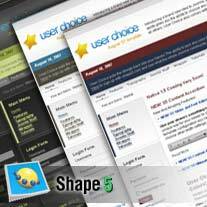 Are you a member yet of the Shape 5 club? If you're not, you're missing out this month with User Choice. The lads over at Shape 5 have basically started from scratch this month and written all the code themselves as they were getting too many conflicts from mixing and matching, so what you get is a theme that now only looks good but really does work without any conflicts. You've got 24 module positions, 23 module styles, the new S5 ultimate drop down, the new slider and font adjusters (very nice) and the new S5 content accordion all thrown in, plus loads more stuff. As a bonus this month you can also download the new S5 Content Accordion module. This module allows you to pull all content or specific content and put it in an accordion effect module for easy display for your viewers. For more information, to sign up or a demo, click here to visit Shape 5.